It can be extended to 34.6 inches, long enough to take some group photos. It is small enough to take it anywhere with ease, whether in your pocket or on your handbag. Perfect for parties, concerts, traveling, sports, video blogging, weddings, beach, aerial photos. allows a variety of shooting angles from traditional selfies to above-crowd shots. The selfie stick provides a wide-angle LED light-compensation lamp which makes the product perfect for night or indoor use. The mirror enable to look for a better angle for the photograph. will provide about 72 hours of LED fill light time, 30 hours of Bluetooth connection time or 3 years of standby time on a single charge. this includes iPhone X,8,8 plus,7,7 plus,6s, 6s plus, 6, 6 plus, 5, 5s, 5c, 4s, 4,Google Nexus 5, 4 and etc.For devices of iOS 10 or later, the selfie stick may not automatically reconncet for next use. 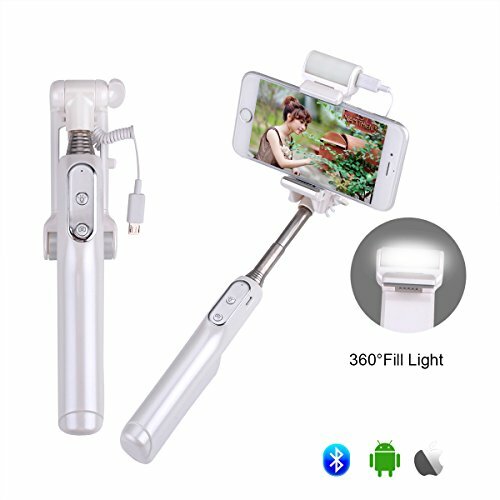 [ Update Version ] This selfie stick with adjustable 360° fill Light rotation provides you more natural light and makes your photos more beautiful, excellent for night photos shooting. [Small and light] 183g weight, 18.5cm/7.3in (shortest)--88cm/34.6 (longest), Extendable and Foldable handheld selfie stick monopod design,you can even put the selfie in your pocket,easy to carry. [ Front& Rear Camera ] With a knock-down mirror and can be taken photo by rear camera, let you show your best beauty all the day and night. and the selfie stick with 1500 mAh high capacity. [Compatity] The clamp of the selfie tsick can extend to 8.2cm, fits for 6 inches or less cellphone. This selfie stick compatible With All Smartphones: iPhone X / 8 / 8 Plus /7/ 7 plus/ 6s/ 6s Plus/6/6 Plus/5/5s/5c/4/4s, ios 5.0 and above; Samsung Galaxy S7/S7 Edge/S6/S5/S4/S3/S2/Note 3/Note 2, LG, HTC, Android 4.2 and above. [Warranty] Every GEANOV selfie stick comes with a 12-month worry-free guarantee. If you have any problem or suggestion, please feel free to contact us, we will do our best to make thing right for you. If you have any questions about this product by GEANOV, contact us by completing and submitting the form below. If you are looking for a specif part number, please include it with your message.